A new trend has developed in the CLO market. Some of the top managers are now able to place the single-B tranches with investors, thus cutting the size of the equity (unrated) tranche. Since the financial crisis, the lowest rated tranche has been the BB. That extra layer of single-B takes the leverage (total CLO size over the size of the equity tranche) from 9-10x to 13x. Just as a reference below are a couple of transactions from 2012. The only way to juice up the projected returns on CLO equity in this low yield environment is to crank up leverage. The leveraged loan market remains quite strong, driven by demand for floating rate paper, low default rates, and lack of M&A activity to bring new supply to the market. 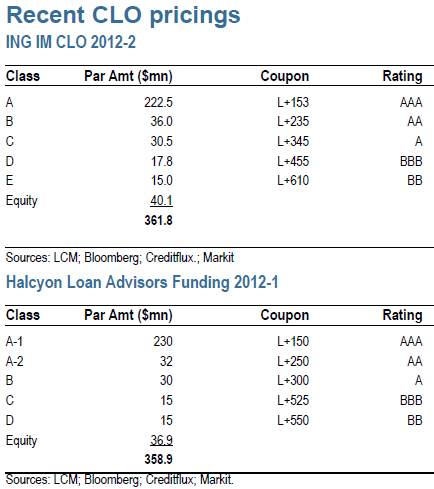 As a result, CLO spreads have declined considerably, from L+150 on the AAA tranche in 2012 to L+115 now. The new single-B tranches now price at the spread that the BB tranches used to price in 2012, as investors reach for yield. With this new demand, the 13x leverage becomes possible.